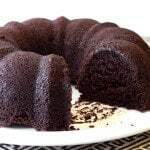 This easy-to-make chocolate bundt cake bakes up moist and dense. It's perfect for parties or "just because." The recipe is dairy-free. If you want to make a dairy-free chocolate glaze, use dairy-free chocolate chips and full fat coconut milk. It makes a wonderful glaze! Adjust oven rack to middle position and preheat oven to 350°F. Spray a 12-cup Bundt pan with nonstick cooking spray. In large bowl, whisk together granulated sugar, white rice flour, cocoa powder, sweet rice flour, tapioca starch, baking powder, baking soda, salt, and xanthan gum. Add coffee, vegetable oil, eggs, and vanilla extract. Whisk until batter is smooth. Pour batter into prepared pan. Allow cake to cool in the pan for five minutes and then turn cake out onto a wire rack to cool. (The easiest way to do this is to place a small wire rack upside down on to the cake pan. Carefully invert the cake and the wire rack. Slowly lift the cake pan off the cake. Ice as desired with chocolate glaze or confectionary glaze. For the Chocolate Glaze: Set cooled cake on a plate. On top of a double boiler, combine heavy cream and chocolate. Heat, stirring frequently, until melted. Allow to cool for two minutes. Stir in vanilla extract. Pour chocolate glaze evenly over cake. Allow to set for 15 minutes before serving. For the Orange Glaze: Set cooled cake on a plate. In a small bowl, combine powdered sugar, water, and vanilla extract. Stir with a fork until smooth. Icing should be thick but pourable; if the icing is too thick, add a little more water. Pour icing evenly over the cake and allow to set for 15 minutes before serving.